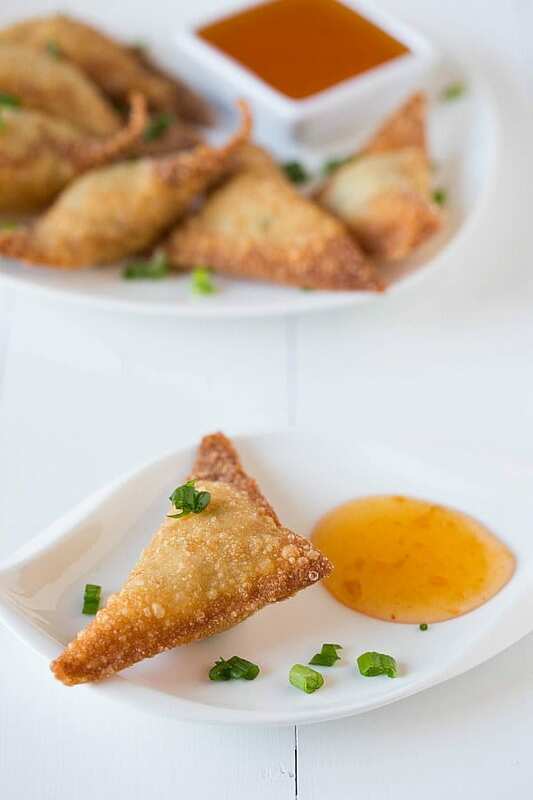 Crab Rangoon is a popular Chinese takeout appetizer, and this recipe recreates the authentic flavor right in your own kitchen! Believe it or not, I made it the whole way through college without ingesting any Chinese takeout. Maybe it was just the group of girls that I hung out with, but we were always way more interested in pizza than Chinese. I tasted it once or twice after that, but it just never did anything for me. Perhaps my taste buds were temporarily defective or I somehow managed to get it from the worst place in the area, because now I can’t get enough of it! During one of my visits to the DC area to see my Chief Culinary Consultant a few years ago, he suggested we get some Chinese takeout while we watched a hockey game. I balked (he must have thought I was nuts! ), but he insisted I try General Tso’s and crab rangoon. I was immediately smitten with both, and now I have to get crab rangoon anytime we order Chinese. The good news is now that I’ve conquered them in my own kitchen, I don’t need to wait for takeout out to enjoy them! If you’ve never had the pleasure of eating crab rangoon, let me explain. 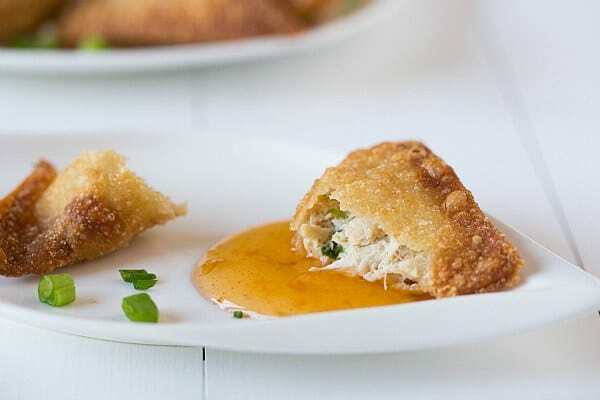 It is a combination of crab meat and cream cheese, along with some additional flavorings, that are folded up in a wonton wrapper and deep fried. Traditionally, they’re served with duck sauce, but you could also have them with soy sauce or nothing at all. Basically, they’re heaven in a fried triangle. I love the creamy center contrasted with the crispy fried exterior of the rangoon. Dipped in sweet duck sauce, you just can’t beat it. I’m always thrilled when I can recreate a restaurant favorite at home, and this one totally hits the spot. What are some of your favorite takeout dishes? In a medium bowl, combine the cream cheese and crabmeat. Stir in the scallions, sesame oil, soy sauce, Worcestershire sauce and salt. Heat 1 inch of oil in a large heavy-bottomed pot over medium-high heat until it registers 350 degrees F.
While the oil heats, assemble the rangoons. On a flat surface, lay out a wonton wrapper with one corner pointed toward you. Place 1 tablespoon of the filling into the center of the wonton wrapper. Dip a finger into a glass of water and wet the edges of the wonton wrapper. Fold the top corner down to meet the bottom corner to form a triangle. Press out all of the air and seal the edges by pressing them together. 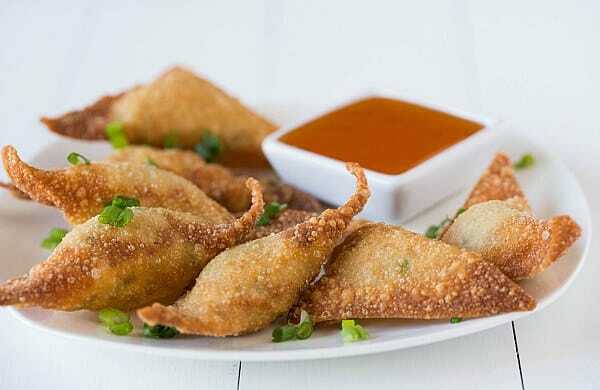 Place finished crab rangoons on a platter underneath a damp kitchen towel to keep them from drying out. When ready to fry, line a baking sheet with a double layer of paper towels. 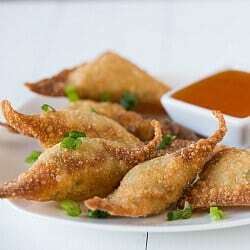 Carefully lower crab rangoons into the oil, about 6 at a time, and fry, until they are golden brown on both sides, about 3 minutes, turning them over once halfway through the cooking time. Remove with a slotted spoon and drain on the prepared baking sheet. 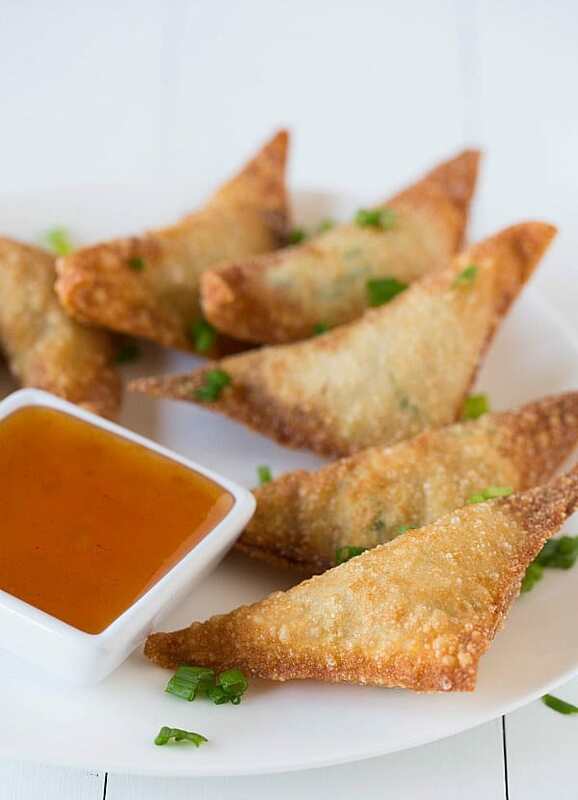 Allow the crab rangoons to cool for at least 5 minutes before serving. You will need approximately half of a package of wonton wrappers for this recipe.